SM Entertainment has confirmed that Girls’ Generation’s Yuri and Oh Seung Hwan has broken up after 6 months of dating. 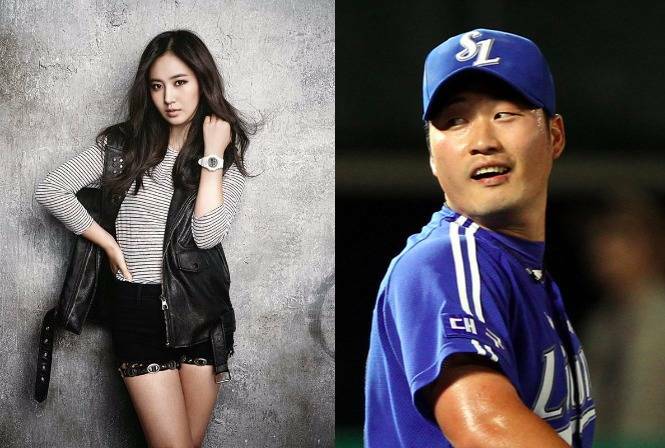 The agency stated that Yuri and the professional baseball player had parted ways after going public with their relationship this April. Korean news outlets reported that according to acquaintances, the two broke up after 6 months because of their long-distance relationship. Oh Seung Hwan is currently in Japan for his baseball career, and Yuri promotes back and forth in Korea and overseas. Though we totally shipped them and they looked super cute together, we guess LDR is a tough hurdle to cross for a new couple like them. In other news, SM Entertainment has yet to confirm if EXO’s Baekhyun and Girls’ Generation’s Taeyeon has broken up. There were rumours that the SM lovebirds have gone their separate ways due to their busy schedules back in September. The pair admitted they were in a relationship back in June 2014, and were the first revealed couple both from SM Entertainment. Well there might be a chance that these two are still together since SME has yet to give an official statement about it. They most probably didn’t want to shift the focus away from Girls’ Generation’s comeback and Taeyeon’s solo debut. What do you think of all these break up news? Let us know by commenting below! The Sam Willows’ latest ‘For Love’ music video is the first of their MVs so far which outlines an actual story plot, and it brought us through a mini roller coaster of emotions we were totally unprepared for. Warning: spoilers ahead! It starts out innocently enough. Clad in shades of white and grey, the band lounges serenely in the middle of a huge room. Then flashes of a sepia-filtered room starts appearing. We see a punching bag, a table filled with pills and a lady who looks clearly exhausted. At this point, we’re getting a feeling that this MV isn’t as simple as it seems. What’s gonna happen next? The scene cuts to a flashback of the aforementioned lady and her adorable daughter. Uh-oh. Something’s definitely up. Yup. Why is the lil’ girl in a cage lined with play mats? And why would anybody kidnap such a cute kid? At least she still has her bunny. Mum’s definitely going to go all Liam Neeson (Taken) on the bad guys. And another one just because Mum’s super badass. This part really pissed us off: you kidnapped the girl and put her in a cage. Now you’re taking away her bunny and waving it in her face? She’s like… four. Not cool bro. We totes cheered when mum came storming in and settled the small fry pretty quickly with some heavy punches and elbows, and even a roundhouse kick. Watch and learn kiddo. We thought she’d grab her kid and run, but then this happened. Uh oh. By now we’re getting some inkling of what this music video’s true message is. But then this creepy dude showed up. Gamers will obviously know that a #BossFight is coming and that #ShitsGonnaGoDown. After that exchange, we were feeling a tad confused albeit relieved that the pair were safe. Why was someone going to such great lengths to disturb their lives? At this point, we saw that there was only 20+ seconds left – they can’t possibly wrap it up properly. Or was there going to be a part two? Then this feel-inducing moment happened and everything became clear to us. The kidnappers represented her battle with cancer and her daughter is her motivation to fight on. Watch the MV for yourself and tell us your thoughts in the comments section below! This just in! Taeyeon’s teaser images for her solo album looks so good, it’s like an angel has descended upon us. We are so blown away by these promo images for Taeyeon’s solo debut right now! Taeyeon’s solo debut will take place on 7th October and her first mini album I, will be released offline on 8th October. SM Entertainment previously announced that Taeyeon would be holding her solo concert series in South Korea later in October. So we’re really sure she will be performing the tracks from her mini album. Stay tuned for more updates! The lads of iKON is back with their half album release! First up is ‘Airplane’, even though the track is a sweet love song, the boys don’t disappoint with their sick rapping. 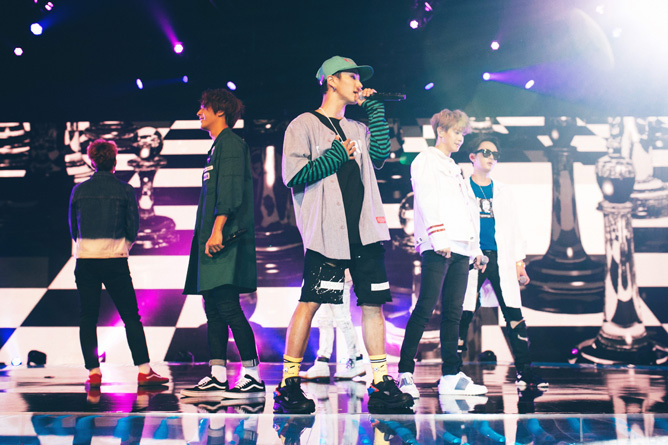 On the other hand, ‘Rhythm Ta’ is an upbeat dance track where the boys show off their moves. On a side note, we would love to see more of Chanwoo – the newest addition to the group. Let us know which song is more your jam by commenting below! If you’re a fan and you don’t dream about getting up close and personal with all of the BEAST boys, you’re either lying or… just lying. Because simply being part of the audience at the BEAST Ordinary Fan Meet in Singapore 2015 on 24 September was an absolute blast, to say the least. 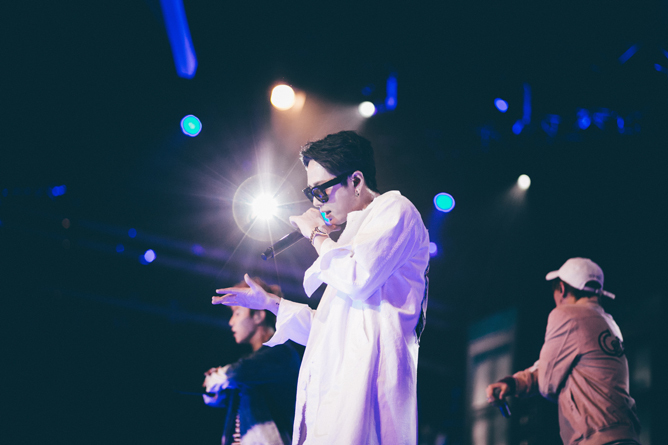 Not to be confused with Game of Thrones’ Varys, Junhyung earns the crown for the Whisper Challenge segment, where six lucky fans were paired up with each BEAST member to compete for the title of the ‘Best Couple’. The boys had to wear headphones and hum out the tune for their partners to guess, but there’s a catch: the songs were all local numbers. In the end, Junhyung and his partner emerged victorious after the latter successfully guessed ‘Ah Boys To Men’ in 25 seconds, winning a chummy selca and a hug from the rapper. Maybe it’s the jet lag or the haze (the particles even went into Kikwang’s eyes at one point), but we thought Yoseob seemed rather out of sorts during the fanmeet. 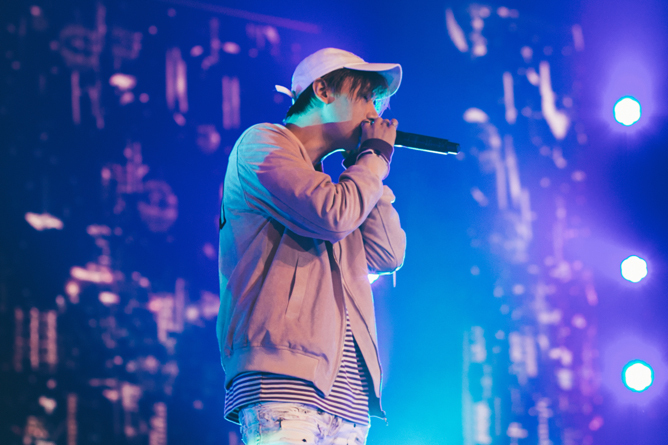 Despite that, he made sure to deliver his best for performances, proving that he’s indeed the main vocal. The thoughtful lad also didn’t forget to throw out some of his trademark heart shapes and aegyo here and there while he’s at it. Aside from the fact that Kikwang looked super cute in his green snapback, the 25-year-old was a ball of sunshine throughout the show. During the Whisper Challenge, he provided plenty of LOLs with his candidly adorable attempt at a Stefanie Sun number. 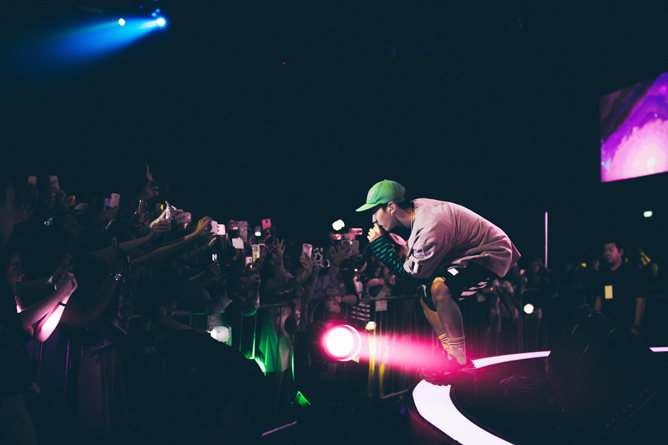 But since the fan is Malaysian, she was totally clueless about the song, leaving him no choice but to squeak out a helpless plea that “the song is ending?!”. A for effort though. 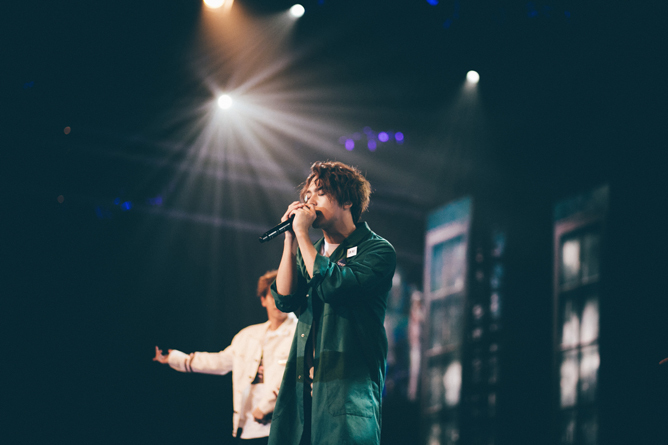 We’re not sure what the (real) maknae Dongwoon ate for breakfast, but he was definitely on a high – hyping up the crowd with cheeky antics (i.e his never-ending obsession with ‘Let It Go’), showering his bandmates with some tough love on stage, and sweet-talking his way into the audience’s hearts. During the Singapore-themed pop quiz, it only took him a simple “I don’t know what the answer is because I only know our Singaporean fans” to wriggle out of the losing spot. Nice moves you got there, Dongwoon. 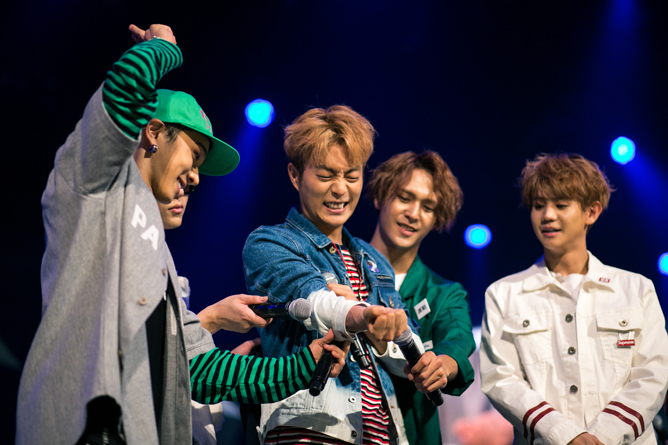 Owing to Dongwoon, the leader came in last for the quiz and had to face the punishment of being hit on the wrist by the other members – to which they spared no mercy, as usual. To add on, his co-player for the Whisper Challenge turned out to be a fan from Hong Kong (check out his hilarious reaction!). Thankfully, B2uties were a kind bunch and gladly helped the poor girl out with the answer: Kit Chan’s ‘Home’. In fact, the patriotic spirit was so strong that they led us into a spontaneous singalong session. Home truly, indeed. 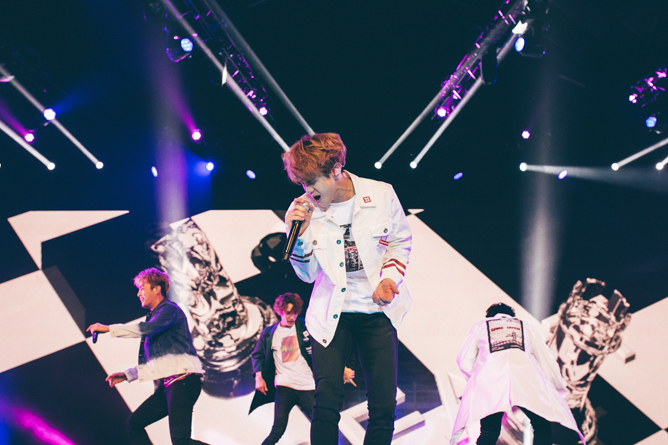 Now that it’s over, who else is up for a full-fledged BEAST concert in the future? Comment down below with ‘YeY’ if you’re with us!